SquigglyTwigs Designs: Easter Dress Begins Today! I've had this picture saved for quite some time. I think many of the details are just lovely. 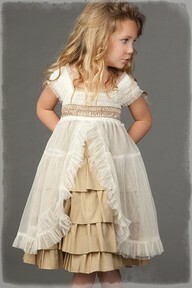 It's beautifully feminine with the light overlayer and lovely ruffles. The moment I saw it, I knew just what I could do and which fabric I'd use. I'll be repurposing a beautiful light blue gown that was rescued a couple of years ago. Stay tuned to see the result. "Inspired" posts are one of the new things we are bringing to you as we "grow". Can't wait to see what you come up with as the inspiration dress is quite beautiful! Thank you. I'm very excited. I visited your blog. Wow! Debbie that dress is gorgeous!!!! I can not wait to see it. Can you please share where you got the pattern? Tiny, I'm designing the pattern as I make the dress. You'll be able to get the pattern here. It's gorgeous!! Can't wait to see what your version looks like! Thank you. I'm nearly finished. I simply love creating.